Yes, this is an adorable small television! The visible display measures only 7" (17.8cm) diagonal, the TFT comes with a NTSC/PAL driver board, enclosure and stand. The display is very easy to use - simply connect the included 12VDC adapter to the 2.1mm center-positive DC jack, then connect a composite video source to one of the RCA cable. Voila, a television display! There's some little buttons on the front that let you enter a menu system for adjusting brightness, color and contrast. The display has two composite plugs, AV1 and AV2. AV1 is the default and if AV2 goes 'live' it replaces AV1. Please note: This is display is a television display and not meant for small text! 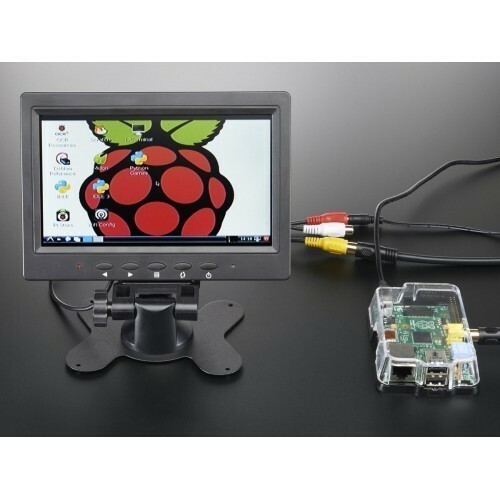 To demonstrate it, we took some photos with the display connected to a Raspberry Pi, but it will also work connected to any analog composite-video output such as a YBox or Propeller w/Video out. It will not work with a device that only outputs VGA, HDMI or any other digital video signal. This screen comes with a 5v-12v US-prong power adapter. Which type of power adapter you get might vary, but we've tested them and they all work fine. Power supply connects to either red or black connector. Note: There are cut-out holes on the body of these screens that are empty. All connections are done through the wire jacks!